A courgette, edamame beans, green beans and goats' cheese salad with a pot of citrus and mint dressing. Vibrant and zesty. Courgette (28%), Peas, Edamame Bean (Soya) (13%), Green Beans (11%), Water, Full Fat Soft Goats' Cheese (8%) (Goats' Milk), Lemon Juice, Spinach, Parsley, Lime Juice, Mint, Concentrated Orange Juice, Sugar, Sunflower Oil, Cornflour, Salt, Stabiliser: Pectin. 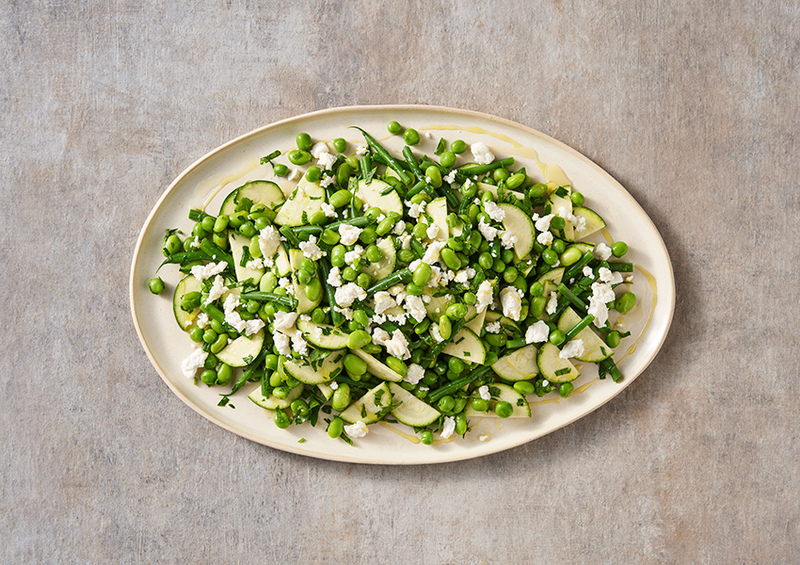 A courgette, edamame beans, green beans and goats' cheese salad with a pot of citrus and mint dressing.